Suitable for non-hazardous areas that contain dusty,dirty or corrosive atmospheres. 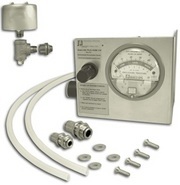 supply of compressed instrument air or inert gas to regulate and monitor the pressure within the sealed enclosure. This prevents the accumulation of damaging and caustic gases and dusts. An enclosure pressurization or purging system that operates on a supply of compressed instrument air or inert gas. A Rapid Exchange purging system that operates on a supply of Compressed instrument air. It regulates and monitors pressure within sealed protected enclousures in order to prevet flammable gas or vapor accumulations. Type X, Ex px certified purging system is a complete automatic system that will purge and pressurize the protected enclosure and maintain pressure within the enclosure. A system that protects general purpose equipment mounted in a standard enclousre so that it can be located and operated in a hazardous area. The hazardous area classification can be Class 1 and/ or Class II, Divison 1.